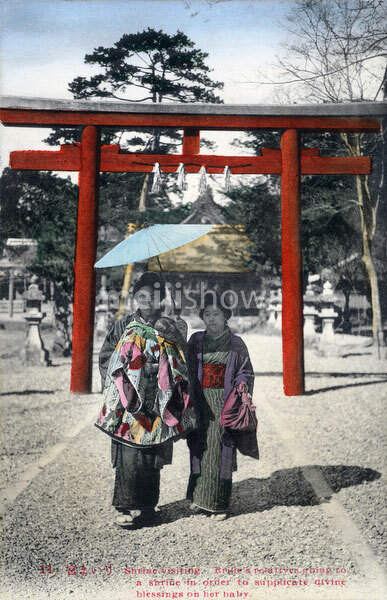 Japanese Marriage: A newborn baby is brought to the local shinto shrine for the first time. Parents announce the baby’s birth to the local deity and pray for the baby’s well-being. For baby boys this was traditionally done 31 days after birth, while for girls it was 32 days. There are several names for this custom: o-miyamairi, hatsumiya-mairi and hatsumiya-mode. This image comes from a series of cards about Japanese marriage customs.